The origin of this name is found in an eleventh-century legend. A younger son of Robertson of Struan saved the life of the king by killing a savage wolf with only his small dagger or sgian. 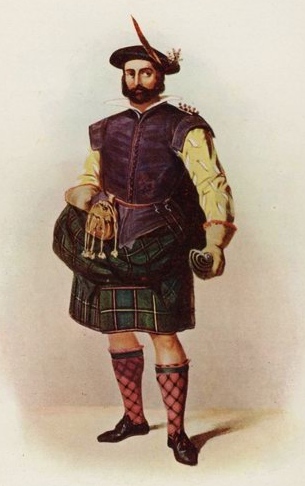 He was rewarded with a grant of land in Aberdeenshire which he named after the weapon; the family thereafter was named for their ownership of the land. The feat is commemorated in the chief's shield, which displays three wolves' heads impaled on daggers or dirks. The first recorded bearer of the name was John de Skeen, who lived during the reign of Malcolm III. After Malcolm's death, he supported Donald Bane, a rival to the succession of King Edgar. His lands were forfeited, and they were only restored when the Skenes joined the army of Alexander I marching against rebels in the north in 1118. His great-grandson, John de Skene, held the lands during the reign of Alexander III, and his son, Patrick, appears on the Ragman Roll in 1296, submitting to Edward I of England. However, the Skenes staunchly supported Robert the Bruce, and after his victory their lands were erected into a barony. Adam de Skene was killed at the Battle of Harlaw in 1411. Alexander Skene de Skene is listed among the dead on the ill-fated field at Flodden in 1513, and yet another Skene laird fell at the Battle of Pinkie in 1547. The Skenes were not Covenanters, and for their support of Charles I they were forced into exile. The chief took service with the Swedish armies under King Gustavus Adolphus. In 1827 the direct line of the Skenes of Skene died out and the estates passed to a nephew, James, Earl of Fife. Other prominent branches of the family include the Skenes of Dyce, Halyards, Rubislaw and Curriehill. Sir John Skene of Curriehill was a prominent sixteenth-century lawyer who was appointed to the Supreme Court Bench in 1594, taking the title, "Lord Curriehill". He was knighted by James VI, and his son was created a Baronet of Nova Scotia in 1626. Sir John's second son, John Skene of Hallyards later founded Skeneborough on the shores of Lake Champlain in Canada. William Forbes Skene was appointed historiographer royal for Scotland in 1881. It was established that John Skene of Halyards was lineally descended from the second son of James Skene of that Ilk, who died around 1604. John of Halyards, matriculated his arms in the Lyon register in 1672, differenced from the chiefly arms by the addition of a gold crescent on the shield. In the petition of Danus Skene, it was asserted that there was good reason to believe that on the death of Alexander Skene of that Ilk with no issue in April 1827, the succession passed to the next most senior line - the Skenes of Halyards. As no other claimant has emerged in the past 167 years, it seems reasonable to conclude that the Skenes once more have a blood-line chief under whose standard they can rally. On 17 February 1994, the Lord Lyon recognized Danus George Moncrieffe Skene of Halyards as chief of the name and arms of Skene, and his son, Dugald, as heir apparent. A dexter arm embowed, issuing from a cloud, hand holding a laurel wreath, all proper.